As winter temps plunge to Arctic levels, it’s the perfect time to think about Arctic animal crafts! From polar bears to whales, these crafts are part educational and a whole lot of fun. Cut the sheet of brown craft foam in half, then cut a semi-circle out of one of the halves. Cut 2 ovals out of the second half of craft foam, then glue the ovals side by side along the flat part of the semi-circle. 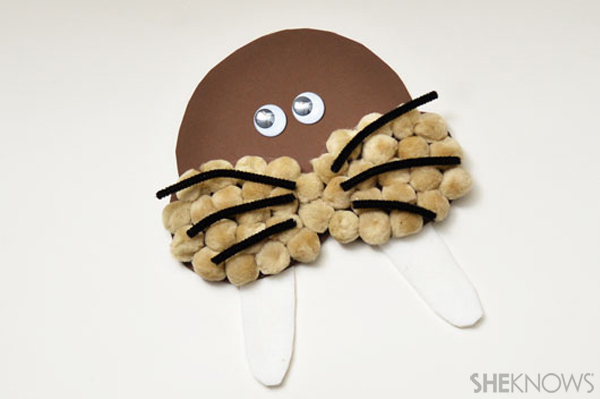 Glue brown pom-poms to both of the oval pieces of craft foam until they are each completely filled in. Cut 2 black pipe cleaners into thirds. Glue 3 pipe cleaner pieces over the top of the pom-poms on each side to make the whiskers. Glue 2 googly eyes to the brown craft foam above the pom-poms. Cut 2 long, skinny triangles out of white felt to make the tusks. Glue the tusks to the back of the walrus head underneath the pom-poms. Turn the cup upside down, then glue the Styrofoam ball to the top of the cup. Glue the end of the white yarn to the top of the Styrofoam ball. Start wrapping the yarn around the Styrofoam ball and the paper cup. Glue the yarn every few inches to keep it from unraveling. Keep wrapping until the Styrofoam ball and paper cup are completely covered. Cut out 2 semi-circles from the white felt, then cut 2 slightly smaller semi-circles from the cream felt. Glue the cream felt pieces to the white felt pieces, then glue the white pieces to the top of the Styrofoam ball to make the polar bear’s ears. Cut 2 arms out of the white felt. Cut 2 ovals out of the cream felt and glue them to the arms. 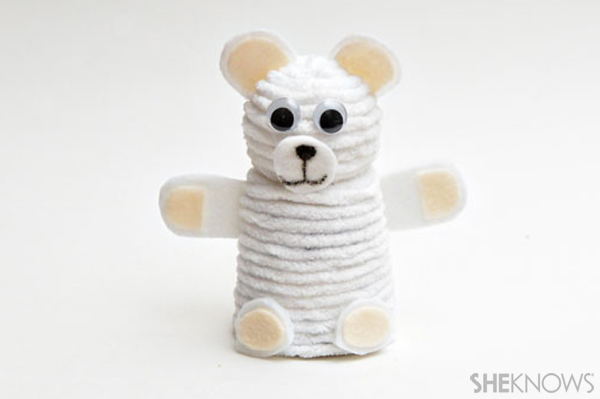 Glue 1 arm to each side of the polar bear. Cut 2 ovals out of the white felt, then cut out and glue 2 slightly smaller cream ovals on top of them. Glue the 2 ovals to the base of the cup to make the polar bear’s feet. Glue 2 googly eyes to the polar bear’s head. Cut out another circle from the white felt. Draw a nose and mouth on it with the black marker, then glue it to the polar bear’s head below the googly eyes. Lay a sheet of tissue paper flat on the table. Place the empty plastic bottle in the center of the tissue paper. Wrap the tissue paper around the bottle and gather it at the neck of the bottle. 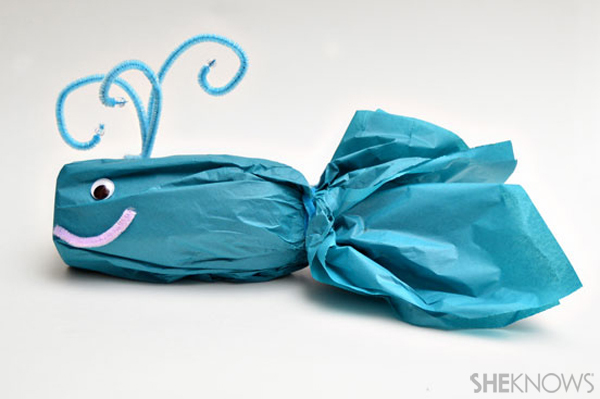 Secure the tissue paper in place by wrapping a pipe cleaner around the tissue paper. Lay the bottle on its side. Cut 3 pieces of blue pipe cleaner. Curl 1 end of each piece, then glue the opposite end to the top of the water bottle. Once the glue is dry, slide a clear bead onto the end of each pipe cleaner. Glue googly eyes to both sides of the whale. Cut a piece of pipe cleaner that is 1 1/2 inches long. Bend it slightly, then glue it below the googly eye to form the whale’s mouth.